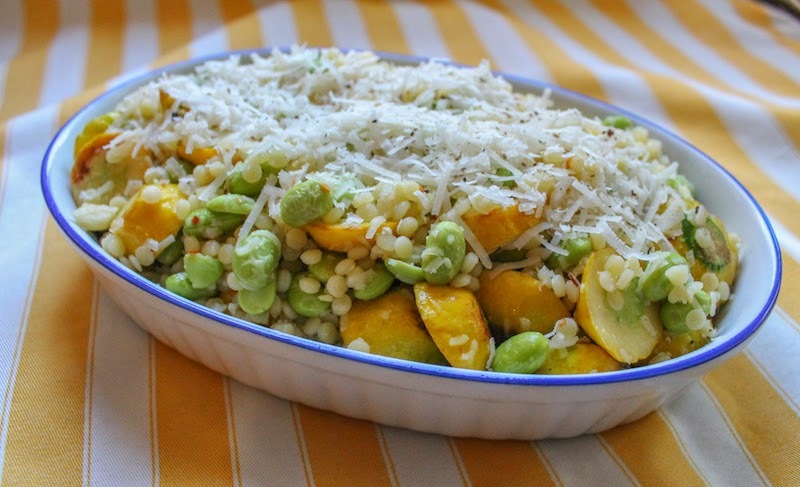 Pan-roasted pattypan squash and edamame tossed with tiny pasta, olive oil and freshly grated Parmesan make a deliciously filling and nutritious main course or side dish. My baby is having a big event tonight. The biggest since her graduation from high school and the biggest until exactly one month from today when she will graduate from university. I was just with her last month when we spent her last spring break working and cooking and shopping and laughing and just hanging out. And I’ll be there next month for her graduation. I struggled, really struggled with the decision to miss her senior show, the culmination of four years of learning and one long, sleepless semester of laborious efforts on her clever design project. So today I’m feeling guilty and tearful. This post is me, sucking it up, by sharing. My younger daughter loves to bake brownies and lately has added her roommate’s mother’s banana bread to her repertoire but she isn’t as fond of cooking. (I know, I know. Where did I go wrong?) Her meal planning is generally predicated on the question, will it go with pasta? She makes a lovely dish with Brussels sprouts that have been halved and roasted in a skillet until they are caramelized and golden. Then she tosses them with hot cooked pasta and an avocado scooped from its peel. 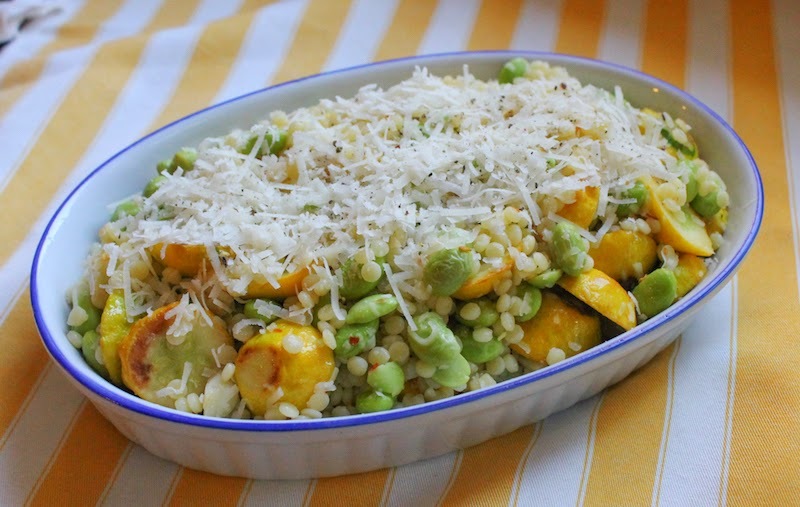 If there’s Parmesan, some of that might get hummed in. But it’s not essential. 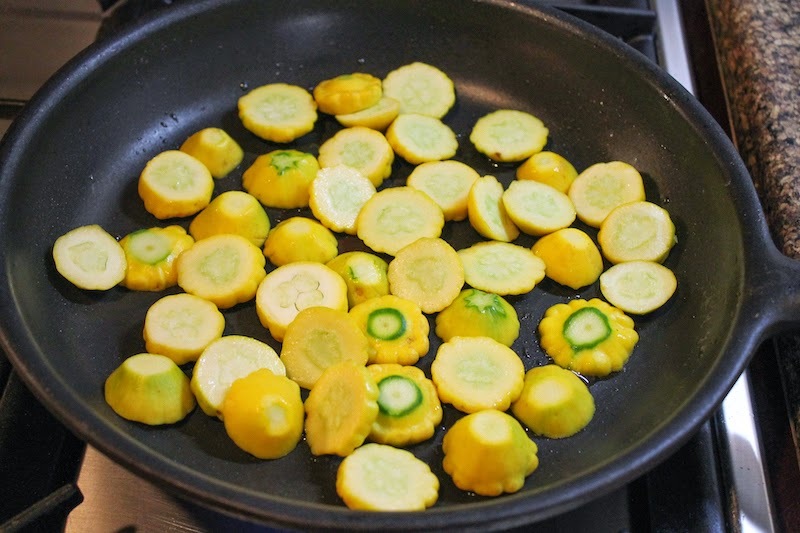 A couple of weeks ago, I was pan-roasting some pattypan squash and thought, “Will it go with pasta?” So I browsed around in the cupboard for a recently discovered pasta shape called pallettoni, which translates to buckshot, a name that amuses me and describes the pasta perfectly. Although she’d probably want me to trade in the squash for Brussels sprouts, she is a fan of edamame so I think my daughter would like this. I may not be there, sweet thing, but you may rest assured that you and your sister are never far from my mind. And graduation is just a month away. And it will be fine. It will be fine. By which I mean, I will be fine. I never had any doubts about you. 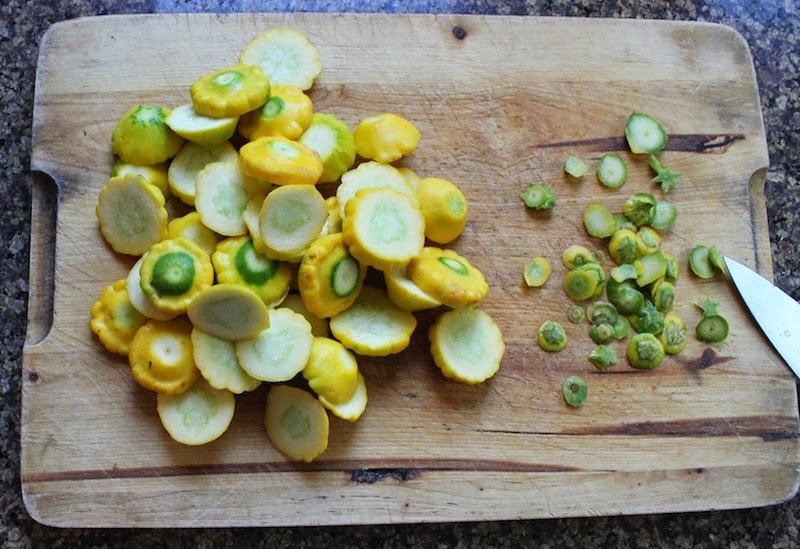 Cut the stem ends off of your pattypan squash and then slice them into two or three pieces. Pop them in a skillet drizzled with a little olive oil, over a high fire, and cook until they have little brown spots all over. On another burner of your stove, boil the pasta in well-salted water, according to manufacturer’s instructions. 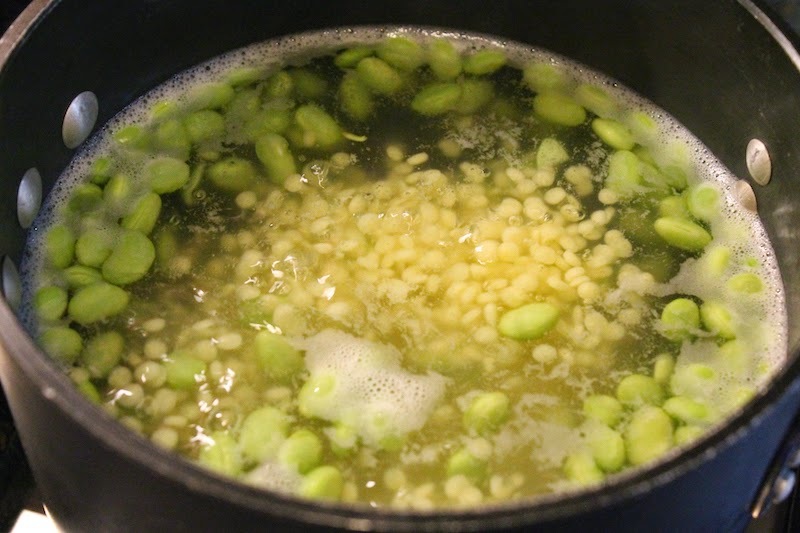 Add in the thawed edamame during the last minute or so. 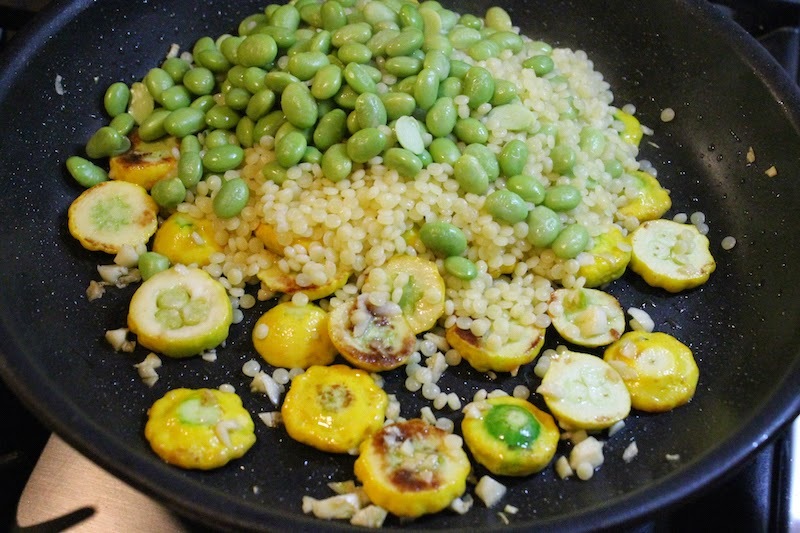 Drain the pasta and edamame and add them to the squash pan, along with another drizzle of olive oil. 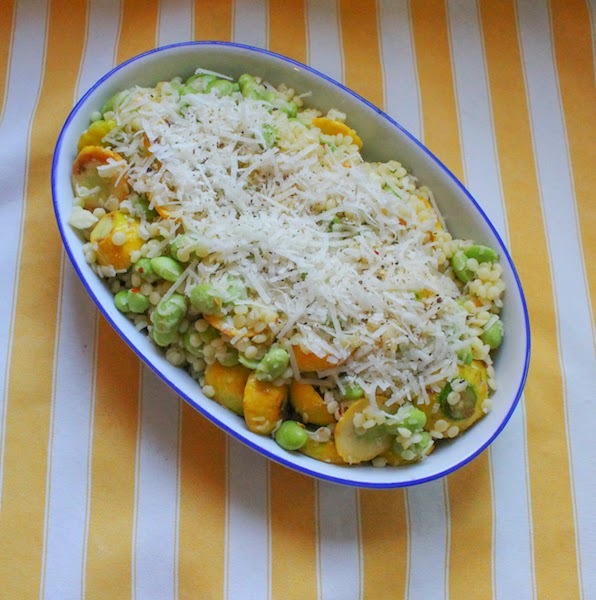 Sprinkle on most of the grated Parmesan, reserving about 1/4 of it to add to the top of the finished dish. Stir in the Parmesan and then taste and season with salt and pepper. 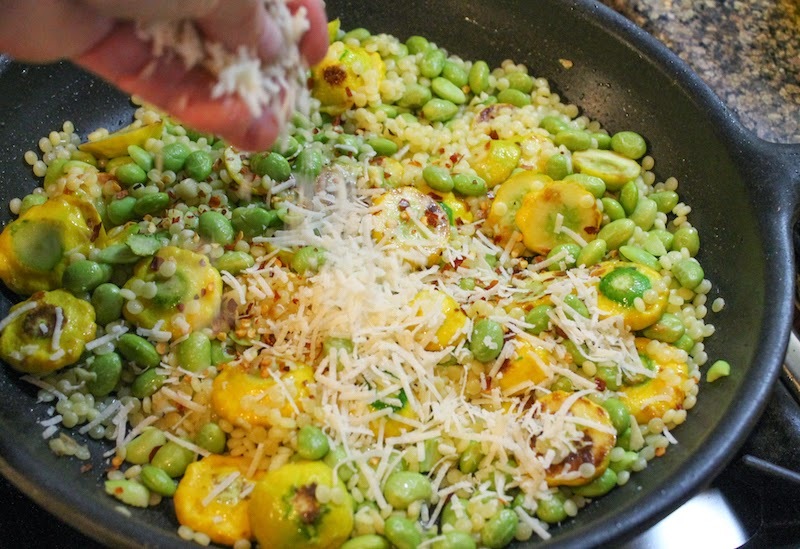 Sprinkle the balance of the Parmesan on top of the finished dish. Add a little more freshly ground black pepper, if you'd like. Ever miss an important event in someone special's life? Tell me the tale and we can commiserate.